"Philippines". The World Factbook. Central Intelligence Agency. ↑ "Republic act no. 8491". 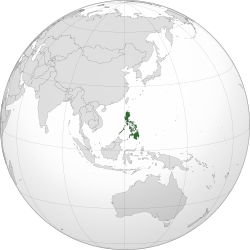 Republic of the Philippines. Archived from the original on ᱢᱟᱨᱪ 8, 2014. Retrieved ᱢᱟᱨᱪ 8, 2014. ↑ "Philippine Population Density (Based on the 2015 Census of Population". ᱥᱮᱯᱴᱮᱢᱵᱚᱨ 1, 2016. ↑ "East & Southeast Asia :: Philippines". The World Factbook. Washington, D.C.: Author: Central Intelligence Agency. ᱚᱠᱴᱚᱵᱚᱨ 28, 2009. Archived from the original on ᱡᱩᱞᱟᱭ 19, 2015. Retrieved ᱱᱚᱵᱷᱮᱢᱵᱚᱨ 7, 2009. ↑ ᱗.᱐ ᱗.᱑ ᱗.᱒ ᱗.᱓ "Report for Selected Countries and Subjects". www.imf.org. ↑ Lucas, Brian (ᱟᱜᱚᱥᱴ 2005). "Which side of the road do they drive on?". Retrieved ᱯᱷᱮᱵᱽᱨᱩᱣᱟᱨᱤ 22, 2009.